It pays to stick around after the show. For me, this is Vermont’s Fifth Season. Beauty in the landscape is overlooked and unappreciated this time of year, because it follows the peak foliage “show”. The leaves are down, but the landscape is still a collection of color and contrast. Though they are not as bright as those in the “show”, warm oranges and yellows still dominate the scene, imparting warmth, harmony and serenity. This scene looks north from Mount Anthony Road in Bennington, Vermont. 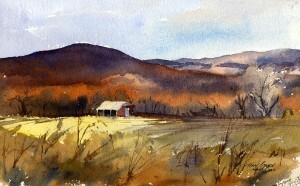 A number of my Winter Hundred paintings were done from this spot including “Taconic Mountains From Mt. Anthony Road” and “Morning Sun & Shade“. It’s a great location to paint from in the morning, because the sun lights up the fields, hills and mountains. During the colder months of the year, the low angle of the sun creates deep long shadows.